During a Joint Press Conference following their bilateral meeting, President Barack Obama praised Mexico as a valued partner and thanked President Felipe Calderon for, “being here today to deepen the cooperation that is so essential to the prosperity and security of both of our countries.” He noted, “we’re moving ahead with plans for a 21st century border so people and goods can cross securely and efficiently. We’re working to coordinate and streamline regulations and get rid of unnecessary trade barriers to make it easier to do business together.” Obama also announced, “we finally have found a clear path to resolving the dispute over trucking between our two countries.” He added, “I look forward to consulting with Congress and moving forward in a way that strengthens the safety of cross-border trucking, lifts tariffs on billions of dollars of U.S. goods, (and) expands our exports to Mexico.” Under NAFTA, the border was to be opened to Mexican trucks, but safety concerns blocked the provision’s implementation. In the coming months, negotiators are expected to table an agreement that will include a phased-in program to settle the issue. 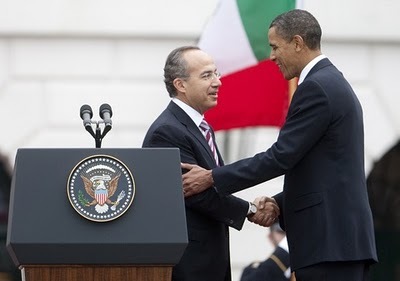 The meeting between Obama and Calderon also focused on regulatory cooperation. In May of 2010, the U.S. and Mexico established the High Level Regulatory Cooperation Council (HLRCC), “to identify areas of mutual interest for regulatory cooperation, with a focus on improving intra-North American commerce and enhancing the competitiveness of North American producers.” In September of last year, the HLRCC, “agreed to work collaboratively to share information about upcoming regulations, identify those regulations that might impede North American competitiveness, and consider joint work in specific sectors.” The recent U.S.-Mexico summit laid out goals for the HLRCC which included linking regulatory cooperation to improve border-crossing and customs procedures, increasing regulatory transparency, as well as making regulations more compatible and simple. Improving regulatory cooperation was a key element of the Security and Prosperity Partnership. The HLRCC is similar to the newly created United States-Canada Regulatory Cooperation Council and is an example of how North American integration has further shifted to a dual-bilateral approach. While the U.S.-Mexico partnership will encounter more difficulties along the way, both countries are forging closer economic and security ties. Unfortunately, rather than plotting a new course, they have recommitted to the failed war on drugs. A stable Mexico is critical to U.S. national interests, but not enough is being done to secure the southern border. Meanwhile, the U.S. and Canada are pursuing a new trade and security perimeter agreement without their NAFTA partner. Although trilateralism has taken a backseat to bilateral initiatives, Mexico remains important to the future security of North America. Be the first to comment on "Expanding U.S.-Mexico Economic and Security Cooperation"